When I was a graduate student, I once heard this story about one of the professors in the department, a world-famous mathematician who was originally from Japan. He was giving a lecture in an undergraduate course, probably calculus, and a student raised his hand and said, “Excuse me, I don’t understand that last step.” The world-famous professor stopped, thought for a moment, and thenÂ said, “Understanding is psychological thing.” And then proceeded with his lecture. I’m not exactly sure what the point of the anecdote is — actually, I think there are several points — but anyway, I was reminded of it on Tuesday, when I went to a lecture by David Pruess at the Mechanics Institute. David is one of the rising stars ofÂ American chess, who holds one of the two Samford Chess Fellowships, which pays him a salary so that he can study chess full-time. David says that he studies about 30 hours a week, plus playing in lots of tournaments. Anyway, the main theme of David’s talk this week was the psychology of chess, and in particular how psychology can cause you to lose a perfectly decent position. He illustrated this with a game he recently played against a Belgian master named Yves Duhayon, who self-destructed in spectacular fashion. The exclamation mark is for the psychology of 6. … d5, which was sort of an announcement to White that his opening has not gone according to plan. Instead of the English Opening he was looking forward to, we have now transposed to the Panov-Botvinnik Variation of the Caro-Kann (1. e4 c6 2. d4 d5 3. ed cd 4. c4 Nf6 5. Nc3 g6), except that it’s an inferior version for White. Usually White wants to play 6. Qb3 and capture the d-pawn,Â followed byÂ moves like g3, Bg2, Ne2, and Nf4, clamping down on d5. With Nf3, White has developed his knight to the wrong square and blocked the long diagonal for his white-square bishop, so this main line loses its punch. So, as David said, the opening has been an “unpleasant surprise” for White. And it got worse: after White played 7. Bg5 David hit him with 7. … Ne4!, another unexpected move that seizes the initiative. What should you do when your opponent plays an unpleasant surprise? David said that a common response is to lash out and try to violently change the course of the game — but this is usually the wrong thing to do. In such positions, he said, you should just calm down and play simple, defensive chess. White has given away maybe 0.1 pawn of his advantage by his poor move order, and maybe another 0.1 pawn by playing Bg5, but that’s no reason to panic. Here David suggested that White should play 8. Be3, basically admitting that his move Bg5 was too optimistic. But such a move is psychologically very difficult to play. Instead of trying to “calm down” the position, White continued to flail around, trying to assert his control in a position where he was no longer in control. The game continued 8. cd Nxg5 9. Nxg5 Qb6 (hitting White where he is weakest, the dark squares) 10. 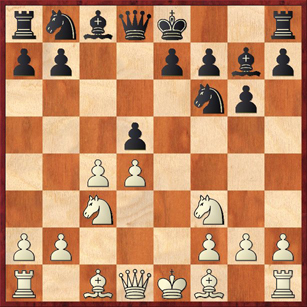 Bb5+ (again too optimistic, in David’s opinion) Bd7 11. Qb3. David felt that this move misplaces the queen. White is trying to play his normal Panov-BotvinnikÂ stuff in a position that doesn’t call for it. David said White should have played 10. Qd2, followed by Nf3 and Be2. It’s okay to play defense! Now White completed his self-destruction with 13. Rad1?? Bxc3 14. Bxd7 Qxb3 and White resigned. IfÂ 15. ab Bf6, White has two pieces hanging and must lose one of them. In some ways this catastrophe was the logical consequence of White’s faulty psychology, his inability to admit that something had gone wrong. a) The most obvious way for Black to go wrong is 13. … a6? 14. a5! Qc7 15. Bd3, and now the development of Black’s queenside is really messed up, and the pawns on a5 and d5 give White a nice space advantage. b) The computer likes 13. … a5?! but I don’t; it allows White complete control over b5, and now White can continue with 14. Rad1, the move he wanted to play earlier. c) 13. … Bxb5? is also horrible for Black after 14. Nxb5 Bg7 15. a5 and the only place for Black’s queen is back to d8. d) The really devilish trick comes in the line 13. … Bf5 14. a5 Qc7? !, which is exactly what I would have played if I were Black. Amazingly, this natural retreat gets into trouble after 15. Nxf7!? (a total computer move, no human would ever consider it) Rxf7 16. Be8! You might wonder, “So what’s the big deal? White gets a rook and a pawn for two pieces, which is a bad trade for him.” But if you look a little bit closer, you realize that after the exchange of bishop for rook on f7, Black’s king will be exposed to the discovered check d6+!, winning Blacks’ queen! That’s why the retreat to c7 was no good. Black now has to play 16. … Qc8 or 16. … Qd8, but neither one gets him out of trouble. For example, 16. … Qd8 17. Bxf7+ Kxf7 18. d6+ followed by 19. Qxb7 (possibly with check) and Black is feeling a bit like a punching bag. The computer gives White a one-pawn edge, although this could be debated. Instead of 14. … Qc7 Black could play … Qd8, … Qd6 or … Qf6, but none of these are really natural moves, and it’s not surprising that the computer gives the edge to White in all of these lines. (e) The only really solid move for Black, I think, is to liquidate some material with 13. … Bxc3 14. bc a6 15. Bc4 Qxb3 16. Bxb3 Rc8, with at most a nominal edge for White. (Actually I think it’s equal.) But speaking of chess psychology, would David really have been able to play this move? He was thinking at this point that he had outplayed his opponent, and the clearest sign of this was his control over the dark squares. So it would have been quite difficult for him to adjust his thinking and give away the dark-square bishop. The interesting thing about analyzing on the computer is that it has absolutely no idea of the psychology involved. So it finds variations like the critical line above, line (d), which I think that no human except maybe Morozevich would ever have played. When you factor in the psychology, David is probably right — Black stood better in the diagrammed position. If you ignore the psychology, White has good chances to get an advantage! 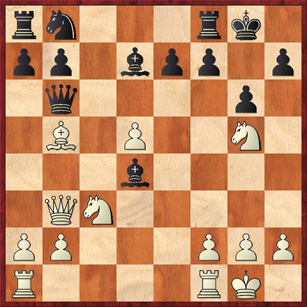 If David ever gets to this position again, he’d better watch out, because it will mean his opponent has preparedÂ 13. a4. Then the psychology will be completely different. So… Yes, indeed, chess is psychological thing! No chess computer will ever change that. There is a movie called â€œStand and Deliverâ€, starring Edward James Olmos, which is about a Hispanic teacher fighting tooth and claw to prepare his Hispanic students for a calculus exam. It is based on a true life episode where all the students passed but were subsequently accused of cheating. The movie proposes that mastering the calculus, far from being a cakewalk, is more like digging ditches under the sun in the equator at noon. – Student: I donâ€™t understand. – Japanese Teacher: Understanding is psychological thing. – Student: So is silliness. Perhaps the Japanese professor learned his teaching methods in a Zen temple. Finding that understanding with the mind is just another form of delusion. With regard to Mr. Pruess’ play. It sounded like he did what is recommended often, that being taking your opponent into unexpected areas. A place where seeing well, and choosing sound moves helps to carry the day. I doubt that I will ever reach the level of play that these two players play at, but for me, my enjoyment in chess is in trying to out think my opponent and when I play well (even in loosing) against a superior player I experience much satisfaction. I think that the most constructive spin to put on the Japanese professor’s comment is that sometimes the human impulse to fit everything into a framework that you understand will prevent you from learning something new. A humble example of that might be the critical line (d) in the above analysis, a line that does not seem to be “understandable” at first. But if you suspend your disbelief and let the computer analysis go where it takes you, maybe you will find that this line does work. Eventually, maybe you will be able to integrate it into a larger understanding of the position — perhaps that White does not need to contest the dark squares, and the threat a4-a5 has more bite than David realized. By the way, I emphasize the word “perhaps.” I would really need to take a good hard look at this position *without* the computer, to see if I believe line (d), and also see if David maybe made some apparently benign move-order error that allowed this bizarre move 16. Be8 to work. So the larger understanding may still be obscure, but the specific piece of data needs to be absorbed. Anyway, I do think that this situation arises a lot in mathematics, where there may be a higher understanding that you can’t get to until you accept that your previous conceptions were incomplete or inaccurate. Many people eventually get “stuck” in mathematics (a lot of them in calculus), and perhaps this is why. I am reminded of something I read of a GM saying that after the opponent made a move he tried to look at the new position â€œas through the eyes of a patzerâ€ (finally, recognition!). I am further reminded of a Tal quote: â€œIf you donâ€™t look you donâ€™t see.â€ I am further reminded of the many references in this blog and in chess lecture dot com to â€œa move that only a computer would make.â€ And of Danaâ€™s difficulties in switching gears between strategy and tactics. Patzers and computers being unencumbered by knowledge look at continuations which experienced chess players will refuse to consider. Patzers, computers, Anderssen, Alekhine, Tal, Shirov, Morozevich and many more of that breed, whose brilliant moves initially look like typographical errors. All of which seems to point to the fact that what we â€œknowâ€ may actually interfere with what â€œis.â€ If that were the case, I certainly wouldnâ€™t know what to do about it. As for the Japanese teacher spouting koans at his pupils to stimulate the achievement of a calculus related satori, who knows, maybe it will work, maybe it wonâ€™t. It would be nice to know the fate of the student who participated in the anecdote. Calculus related satori. 😆 I want such a teacher! I agree that playing and learning chess is a psychological thing. I don’t believe there’s any concept (including chess) which is beyond the human mind’s capacity to understand, though. We may not initially understand something, but whether or not it continues to be that way depends on what we choose ourselves. That could lead to an interesting discussion on free will, since it’s probably very predictable what any person will understand, if only you know what they’ve made sense of until now and how they’ve made sense of it. Also, since there’s no limit to what we’ll understand if only the psyche permits it, I think that before actually trying to learn something, people must be taught to believe in their ability to learn. This is kind of a hidden problem because it’s only an unconscious attitude of viewing who you are as something static, or pessimistically thinking you’ll only get worse for whatever reason. A big part of learning is to just dare to hope you might learn if all you do is try. Just trying in itself is an incredibly effective way to learn: the way children do it, who are ofcourse perfect learners (untill someone messes them up and gives them a false attitude). But the most important thing perhaps, is to be happy in where you are at the moment. People who learn in order to run away from something (like painful mistakes), might improve a whole lot technically, but how fun is the improving process? And isn’t life itself just one continued learning experience? I think the real art to understanding and improving, is to improve because you want to grow something great even greater, and not to change something bad to great, which is impossible! And isnâ€™t life itself just one continued learning experience? Oh, definitely, learning how to live is not as simple as it sounds. I think it has to do with what you’re ruled by. I think that in the beginning, people are slaves to emotions, which chains them to all kinds of negative people and behavior. I observe that in myself; when I allow myself to be ruled by my anger, I’m suddenly no longer emotionally free of the person I’m mad at, and if that person really is a bad person, being connected to him/her in any way, even an angry way, just makes me repeat their behavior for myself and if it happens for years it can transform healthy people into the people they were trying to fight. That’s what happens alot to young people IMO, because it’s so immediately satisfying to rebel against what you see is wrong. But in the rebellion itself lies the possibility of changing sides all the times. Like policemen who constantly observe that criminals prosper. Who’s more in danger of becoming corrupt? Learning how to live is to truly be free on a mental land physical evel from all the poisons that are so common in society. It’s so difficult that I think you have to devote yourself constantly to doing it, unless it becomes second priority, then third, and is in the end forgotten. But devoting yourself to something like that also means to keep alot of other things simple, because within complexity there are often traps! Like in a chess position. Next post: World championship — how much do you care?